“…because we’re doing the best that we can.” Margaret George, Historical Novel Society conference, 2016. I’ve never been to the Historical Novel Society conference before, but after last weekend I’m wondering why. It was splendid. If you want to read a well thought-out blog piece about it, there’s one in the Times Literary Supplement. If you want a few photos, some scrappy notes and some Anglo-Saxons banging their shields and yelling, then, dear reader, you are in the right place. Panels – a row of people behind a row of tables. Discussions – two or three people looking at each other across a low table. Talks – one person behind a lectern. Or standing beside a table. Could be anybody, because they’re too far away to tell. On the right: Tracey Chevalier, Richard Lee of the HNS, an illegible screen and the backs of two heads. Luckily the talk was much better than my photography. The Dinner – lots of people leaning against each other and looking cheerful around a big table. After the dinner– people standing around clutching drinks and looking very cheerful, despite the absence of tables. Whilst these sort of pictures are fine if you know the people involved, or if you have always wondered what the person who wrote that hideous torture scene might look like, they aren’t exciting. So, I have vowed to take (or at least show) no more of them. In future, any panel that can’t come up to the standard of Paula Lofting and Regia Anglorum‘s “How to Build a Shield Wall” isn’t going to get a look-in. Although they might get a quote, because some things are too good not to pass on. But where, you may be asking by now, are the Anglo-Saxons beating their shields? Was that them, above? No, there’s more. We’ll get there in a minute. First, I’d like to celebrate the glorious Battle of Fulford tapestry. (Not, as I inadvertently called it on Twitter, “the Battle of Fulford Tapestry,” an otherwise unknown medieval skirmish over needlework). It’s six metres long, it was displayed at the conference by its designer, Chas Jones, and you can find out all about it on this website. You may recognise the style. 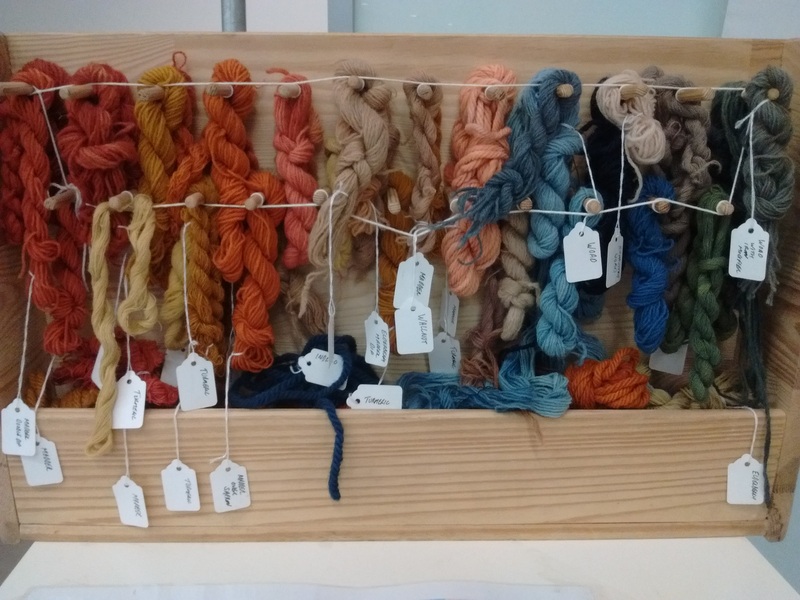 And this is how they got those lovely colours for the wool. I tried to turn all the labels around the right way before taking the photo, so with luck you can zoom in and read most of them. There was, of course, a very fine Gala Dinner on the Saturday night.The guests included Queen Boudica, an elf, a witch, a monk, Tilla (or rather me, wearing her clothes), a gondolier, and Mrs Lincoln. On looking at the photos it’s clear that Tilla enjoyed the evening a little too much and all the photos she took were a bit blurry. This is her best effort at Mary Todd Lincoln, whose splendid outfit won first prize in the costume pageant. So that, gentle reader, was a very brief roundup of some of the highlights of the HNS conference. In the year that marks the 950th anniversary of the Battle of Hastings, we will leave the final word to Harold Godwinson’s men. Some of whom are women. But as they say about historical fiction, it’s all lies anyway. Previous Post‘Medicus’ is today’s Kindle UK Daily Deal!Next PostVITA BREVIS is (almost) out in the UK! I didn’t find that boring at all,very entertaining and well written. I always suspected Tilla was you, or vice verse,do you have a photo? What fun! Surrounded by historical fiction writers some of whom doubtless have significant issues dealing with the here and now. Thanks for the links to other scribblers of your ilk. Of course few rise to your level but at least your dedicated fans will have something to read until Ruso and Tilla make it back to Britannia. Supposing that they do … To say I can’t wait until the next MEDICUS installment does not convey the depths of my longing. I trust that you are composing as fast as you can, between book tours, digging in the rich English soil, answering fan emails and responding to the other assorted nuts that pop up in an author’s life. Seriously, great rundown on what sounds like a wonderful event. Oh, to have been a fly on the wall. All the plot twists and conflict ideas floating in the air. Must have been truly grand. Cheers, from across the Pond! It was a grand weekend, Jamie! Sorry for the slow response – things have been a bit hectic here. The next HNS conference is in the States – Portland, Oregon – so you can do it all again (or similar) over there next year! Are you going to attend? If so, I’ll bring all my books for you to sign and get a pix next to you. Cheers! Thank you Anita! You’ve done a terrific job with the HNS PR. Looking forward to seeing you at a future conference as a writer! Thank you Carol. There was so much good material to work from – congratulations on a wonderful conference! Love, love, love this post, Ruth. Such great observations. Thank you!